“Hello” – Shaun’s (Freddie Highmore) proposed treatment for a homeless patient puts him and Jared (Chuku Modu) in Andrews’ (Hill Harper) crosshairs. 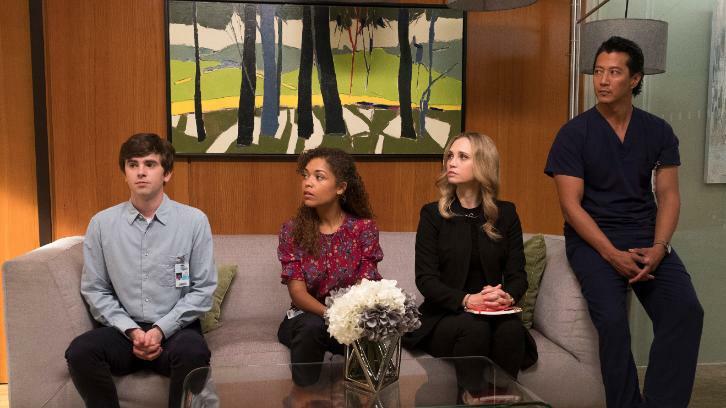 Meanwhile, Claire (Antonia Thomas) tries to overcome Melendez’s (Nicholas Gonzalez) reluctance to do a risky heart operation while Glassman (Richard Schiff) must overcome his personal feelings about his oncologist, Dr. Marina Blaize (guest star Lisa Edelstein), and face a difficult decision about his health, on the season premiere of “The Good Doctor,” MONDAY, SEPT. 24 (10:00-11:00 p.m. EDT), on The ABC Television Network, streaming and on demand. The series stars Freddie Highmore as Dr. Shaun Murphy, Antonia Thomas as Dr. Claire Browne, Nicholas Gonzalez as Dr. Neil Melendez, Hill Harper as Dr. Marcus Andrews, Richard Schiff as Dr. Aaron Glassman, Tamlyn Tomita as Allegra Aoki, Christina Chang as Dr. Audrey Lim, Fiona Gubelman as Dr. Morgan Reznick, Will Yun Lee as Dr. Alex Park and Paige Spara as Lea. “Hello” was written by Freddie Highmore and directed by Mike Listo.